The North’s political process has ground to a halt after the DUP dramatically reneged on a deal to appoint a Sinn Fein Speaker of the Stormont Assembly and then entirely boycotted the opening of a new round of talks in Belfast. On Tuesday, Deputy First Minister Martin McGuinness said the “eyes of the world” were looking on at Stormont to see whether the parties would be able to agree on a new Speaker. 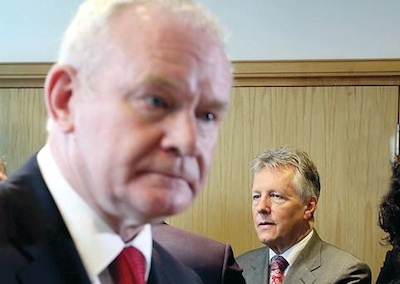 But DUP leader Peter Robinson said the deal by which Sinn Fein’s Mitchel McLaughlin should have taken up office following the resignation of DUP Speaker William Hay was at an end. The arrangement stretched back to the last Assembly term, when the late Ian Paisley was First Minister. She was referring to welfare cuts demanded by the London government. Sinn Fein has consistently denied any deal was agreed on “Tory cuts” it has assiduously protested against. The financial stand-off had threatened to hit funding of government services, until London last week agreed to extend emergency funding to Stormont. But the failure to appoint a Speaker has come as a new blow to an institution which has long appeared on the point of collapse. Robinson then rubbed salt into the wound by refusing to take part in the opening of the crisis talks in protest at the presence of Dublin’s Minister for Foreign Affairs, Charlie Flanagan. He also rubbished the opening talks session as a “circus act for the media” and a “showpiece”. Despite their absence, the DUP insisted the talks take place at Stormont House, rather than Parliament Buildings, in order to further refute any suggestion of a role for Dublin in political matters in the Six Counties. “There could be no question of a permanent presence for the Irish Government in the building during any talks,” said Mr Weir. On his arrival for Thursday’s opening session, Sinn Fein’s Deputy First Minister Martin McGuinness launched a scathing attack on the DUP. Mr McGuinness told a press conference at Stormont that the last two years had been appalling “because of the unwillingness, refusal of the DUP and other unionists” to accept “democratic decisons”. He cited decisions “taken by by Belfast City Council, parading decision taken by the Parades Commission, pulling the plug on on-the-record commitments - things like the development of the Long Kesh site - and of course, the latest example, which I think is symbolic of the inability of the DUP to accept equality, the dishonouring of a commitment made by Ian Paisley and Peter Robinson with regards to the installation of a Sinn Fein speaker for rest of this term of the assembly”. However, he said the British government was “as much a part of the problem”. “We will not be found wanting, I hope others will not be found wanting,” he said. The talks will involve the five executive parties and representatives from the British, Irish and US governments, and are being chaired by British Direct Ruler Theresa Villiers. Sinn Fein’s John O’Dowd said an agenda and procedure for the talks still needed to be agreed. One major question centres on sectarian anti-Catholic parades, despite a pre-talks concession to unionists for a new body to look at the issue. Villiers said a four-member panel will be tasked with bringing forward a report on the confrontations in north Belfast by January 31. Unionist paramilitaries and senior representatives from the Orange Order have been part of a combined unionist delegation involved in the parades issue in recent weeks. They had asked for a “commission of inquiry” with legal powers after an Orange Order march was rerouted away from the nationalist Ardoyne area in July. But it is unclear how the proposed new body might gain any credibility with nationalists. Other than parades, the most likely issues for the talks are welfare reform (including social inequality and discrimination), parades, the past and flags. Other possible issues include a restructuring of the new political institutions, housing policy, policing reform, the judicial and prison system, support for the Irish language, and the preservation of the former Long Kesh prison. A British general election will be held next May and Christmas is being mentioned as an effective deadline for the current talks. But expectations remain very low, and there have even been suggestions that the talks have been set up to fail. According to some commentators, this could see a return of devolved powers to London, at least for a period, to allow the direct implementation of deeply unpopular welfare cuts such as the bedroom tax and water charge.